It had been a dry fall: amazingly dry, and the third one in a row. We awoke at home on Saturday morning, to the odor of forest fires, set by crazies in the surrounding counties, looking for some sort of thrill that only they can understand. Having had to change our plans for a fall color backpack the last two years, and being wary last January when we had to plan this excursion, I had what I thought then was a pretty brilliant idea: head for a "canyon" on the Cumberland Plateau. While it had been 20 years since I had ventured into Savage Gulf, I figured there had to be water running in the creek beds that cut those huge gorges millions of years ago. After all, the elevation was pretty low, and we would be in the bottom of a drainage. Well, I figured wrong. I had called the "Ranger Station" on George's suggestion, and had asked the woman working there (it turns out she is not a real "Ranger") what the water situation was. She reported that there were a few pools, the color of "root beer." (This turned out to be only partly true: there were some pools like those described near Savage Falls, but there was no water flowing in the lower drainages whatsoever.) So I encouraged everyone going on the hike to carry a water treatment system if they had one. Our experience at Boston Charlie's camp on the Bailey Range Trip had shown that our PUR Hiker could convert anything into drinkable water. 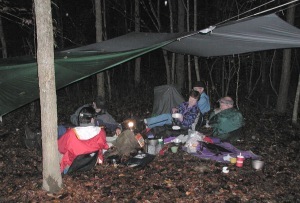 Since this was an official Sierra Club outing, I expected a good size crew, but even my expectations were exceeded. After a complex system of meeting points, 19 of us in seven vehicles pulled into the Savage Gulf Ranger station near Barkertown, to get our hiking permits. Note that a permit is required for overnight use of a trailhead, and the State will issue a permit at one of a couple of the ranger stations. They limit party size by limiting the number of carloads. It seemed that the attendant was having a difficult time grasping the concept of a hike that would involve the shuttling of vehicles, and not be a loop, like most of the backpackers do. Since the forecast was for rain (the first in weeks and weeks) and the fall colors were way past their peak (due to the dry fall), the competition for backcountry sites and parking was not great, although there were lots of hikers at the Ranger Station. We were underway by 10:30 am Central time, having gained an hour coming west. The trail, which starts on the west side of Collins Gulf, heads through pretty non-descript forest, obviously logged heavily in the past, for a bit, and then starts to drop toward Suter Falls. 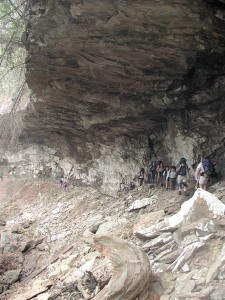 There is a huge rock overhang on the way to the falls, which everyone had to - rightly - drink in, despite the dismal weather. Suter Falls would look pretty neat, as it is a shear drop maybe 30 feet, if there had been some water. As it was, a forlorn trickle dropped off the shelf, and splashed its way down the drainage to the "river". Since we were only headed to Sawmill Camp this evening, there was no hurry, so I encouraged everyone to stop for lunch when we got to some switchbacks, as the trail headed for the floor of the "canyon." The gorge is about 500 feet deep at this point, so you really do have the sense of being in a canyon. After lunch, we continued to drop on the Collins Gulf trail, our next scenic attraction being Horsepound Falls, which is off the trail to the right a hundred meters or so. Horsepound is pretty interesting. The Collins River is flowing over lovely rock shelves at this point. On this afternoon, it looked more like a small creek than a river, but nonetheless, it comes to this sharp shelf, flows over the edge for a drop of maybe 25 feet, and completely disappears into a jumble of rocks, nevermore to be seen - at least on this trip. The photo in the hiking guide must have been taken after a major deluge. After we left the falls, the intermittent mist changed to a drizzle: not enough to soak you right away, but sufficient to dampen an already-damp day. One of our party even erected their umbrella to hike under. After the trail crosses - very slippery rocks - permanently to the east side of the creek, it starts following an old jeep road. The footing was pretty good, and soon, we came to the side trail that leads back across the creek bed (still no water, just a pile of rocks) and up to Schwoon Spring. I had heard that this was a pretty reliable water source, and indeed, once you climbed all the way up to the cave, there was water trickling out. However, the water level was sufficiently low so that the hose someone had placed to run the water to a more convenient spot for filling bags and bottles was no longer intercepting any water. I hiked the 300 meters or so back to the trail junction to report the status to those that were still waiting for a water report, and encouraged folks to get their water one at a time, otherwise, there would be a lot of waiting while the precious liquid was being scooped out of a quart-sized depression. Susie and I hiked back to the spring and loaded up both our bag and all our bottles, and waddled down the trail to camp under the extra load. Early morning fog yielded to clear blue skies, and this day was to provide a good lesson to all hike leaders: never assume that all the members of your party have taken the time or trouble to remember the planned hiking route, or consulted you if they haven't. I thought I had explained to everyone our route for today: we would ascend the west face of Collins Gulf (the canyon at the mouth of which we were camped on the old Historic Stage Coach Road., and then follow the aptly named South Rim Trail as it wound along the south rim of Savage Gulf, back to the Ranger Station. In retrospect, I should have explained things more thoroughly. With a crew of 19, even though you try to get everyone to leave camp at the same time, inevitably, there will be those that depart quite early (like George, who just wants to take it easy, and enjoys the walking as much or more as he likes being in camp) and those, like Will, who move with all the quickness of a lizard on a frosty morning. Susie and I tend to be closer to the latter category, as we are typically the last or next to last to leave camp. On this morning, we took off ahead of two of the fellows, with Will and Diane bringing up the rear. When we made it to the top of the first rise, where the Connector trail intersects the Historic Stage Road, most of us stopped and waited. I knew we had a problem when the sweep team (Will and Diane) showed up, but not the two other fellows. Will and I took off back down the trail, yelling at the top of our lungs. Eventually we made ear contact, and it turns out that they had somehow missed the trail junction right outside camp, and had taken off to the west. About the time we started shouting, they realized that things were not as they should be and turned around. No real harm done, but it was a reminder that with a large group, it is probably best to direct traffic at any trail junction, just in case your verbal instructions lack clarity or impact. The Historic Stage Road is more like a rock garden than a road. As we hiked up towards the cleft in the escarpment, Susie and I commented on how tough it must have been to actually get a stage coach up the track. Years of erosion had taken their toll, and a lot of concentration was required to avoid the ankle twisters. 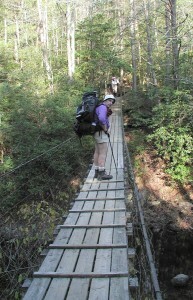 We were thankful for our foresight at having carried our walking sticks on this trip. They seemed critical to safe negotiation of the route. 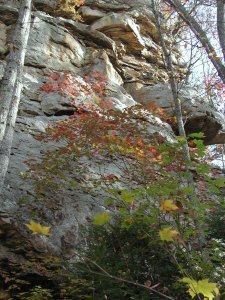 There are some fine rock outcroppings as the trail nears the top of the plateau, and we went through a small band of trees where there was still a tad of fall color left. Most all the trees above and below this elevation had lost their leaves. 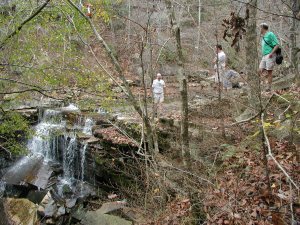 Most of the rest of the crew had stopped for a rest break near a small spring at the top, where the trail intersects the Collins Gulf Trail heading south and the South Rim Trail heading east. It was the first real running water we had seen since the spring (if you don't count last night's rain), and everyone tanked up. To say that the South Rim Trail back to the Savage Gulf Ranger Station is not the most direct route in the world is a massive understatement. 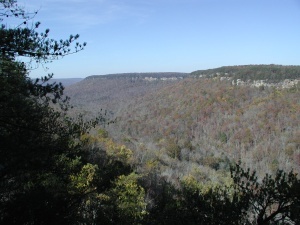 It seeks out the view spots along the South Rim of Savage Gulf, but attempts to accomplish this maintaining a perfectly constant elevation. The result looks like a trail designed by someone with a blood alcohol level of 0.3%. While it is about 3.5 miles from the trail junction to the Ranger Station "by air," the trail requires 7 miles to cover the same distance. Of course, the point, as George would make later that evening, is not to cover the distance directly, but to be walking in the woods. We all stopped for lunch near one of the viewpoints, but the breeze kept many of us from actually resting on the promontory: the wind made the experience a bit too-refreshing, and so most of us sought the warmth of the sun back in the woods. During the afternoon, as we strung out along the walk, we could often see one part of our group hiking in one direction, and another in the opposite. Once, Susie and I took off through the open woods for a more direct routing, covering the 100 meters of trail in about half that distance. The views along the gorge were mighty fine, but the fact that we could see some houses near the rims reinforces the need for more conservation easements, and outright protection of these spectacular forested canyons. There are just way too few wild places left in Tennessee, outside of the National Parks and Forests, and it is critical that we preserve those we have left. As you near the junction with the Savage Falls Day loop, the "floor" of the canyon gets sufficiently impermeable that there is water flowing in the stream bed. We stopped for a while to take a look at Savage Falls, and marveled at the huge suspension foot bridges the State of Tennessee has constructed over the creek bed further up the drainage. They seemed an example of overkill in this dry part of the year, but I would imagine I would be thankful for their presence during a major spring rainstorm. 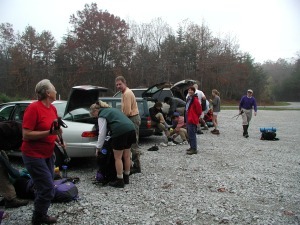 We got back to the Ranger Station about 3:00 pm local time, and I was reminded of another lesson for leaders: Make sure that all your shuttle drivers have their car keys with them, as opposed to being locked in the cars waiting at the other trailhead. Fortunately, Pat's Explorer had sufficient room in which to pack all the drivers, and we were able to run the car shuttle with no difficulty. Sometimes, you just get lucky.